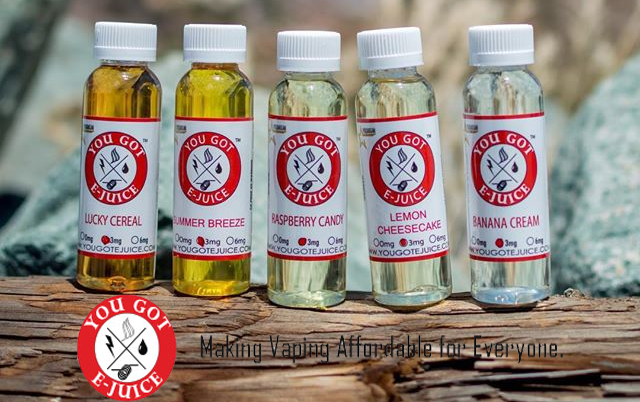 After recently testing this product from You Got E-Juice , E-liquid line, It is an Fantastic Full Bodied flavour and crisp clean quality on the exhale , it creates enormous clouds and has a perfect balance of price to volume ratio. But there’s a complimentary aftertaste making this juice just amazing, making them one of our favourites . This company is so humble with such a wonderful understanding of what people want to vape , they merge fantastic flavours with clouds and price! A sweet pleasurable palette flavour like closing your eyes and biting into a classic sweet cookie with icing , all i can say is its ridiculous to get that flavour in a vape juice , i love it! Oh my word! i've tried and tested many strawberry desserts flavours and could not fault it so much flavour so much clouds , its fantastic. Well! where do i start, think of the festivities near the end of the year that wonderful aromatic christmas feel when you see that glazed cinnamon bun its exactly that ! but dont expect a harshness from this juice its perfectly blended ! Me just like you, love a good custard juice throw some strawberry into the mix and people genuinely ask me what juice i'm vaping as they want to try it and when they do they are mind blown even people stuck in there ways are asking for the link . Well done guys you have done the vaping industry and the vaping community proud! For the link i keep getting requests for go Here. Such a pleasure to work with this company, After they sent me out a wonderful surprise box of juice to test. Ive got to say a huge thank you to Cat for being wonderful. Just imagine that wonderful sketch where there a pie on the window sill and everyone can smell and says what is that glorious smell , thats the effect this juice had when testing , so nice on the palette. This Juice is like inhaling a glass of sprite with ice in , just wow! refreshing on a summers day. A rich nutty medley of strong flavours like the wine version of vape juice , but i dont personally like tobacco flavours but its not bad even for me. Go Check There Store Here for some fantastic deals ! Such a pleasurable juice, the clouds are fantastic, and makes you feel content with the quality and price. It truly is a delight and much better as a dripper juice rather than a tank juice , its crisp clean and very tasty. Surely one of the best fruits you could vape , again fantastic for dripping wonderful product, neither overwhelms the other. Imagine a fox's glacier mint, its exactly that and my word a lot of menthols are super tough on the lungs, this is not one of them , its perfect! Such a calming juice extraordinary for everyday use , if you like honey flavours its balanced just right. Unlike the other blueberry flavour in the product line this one adds a subtle extra sweetness , everytime you hit your lungs with this juice you think fairground , its great. Now The only issue i find with this product is not the juice itself its the packaging when removing the clear film from the bottle the ink is still tacky causing slight smudging and leaving fingerprinting on the label. Astonished at the quality and price of this line , Thank you for supplying the general public , us vapers such a good product. Go order your own and try for yourself over at there store Here. E-Cigarette Accessory Reviewing Company. We Test In House Juices, Mods + More! We Visit Stores Throughout The UK and Promote Them.